"This is what I cook, when I don't feel like cooking"
I called my husband and said I didn't feel like cooking tonight, he was fine with that. But when my kids later asked 'what's for dinner' I said I didn't feel like cooking, so it will be something simple like bacon and eggs, that I can make quickly, they're fed and I didn't spend a fortune buying take out. Well my daughter had other ideas. 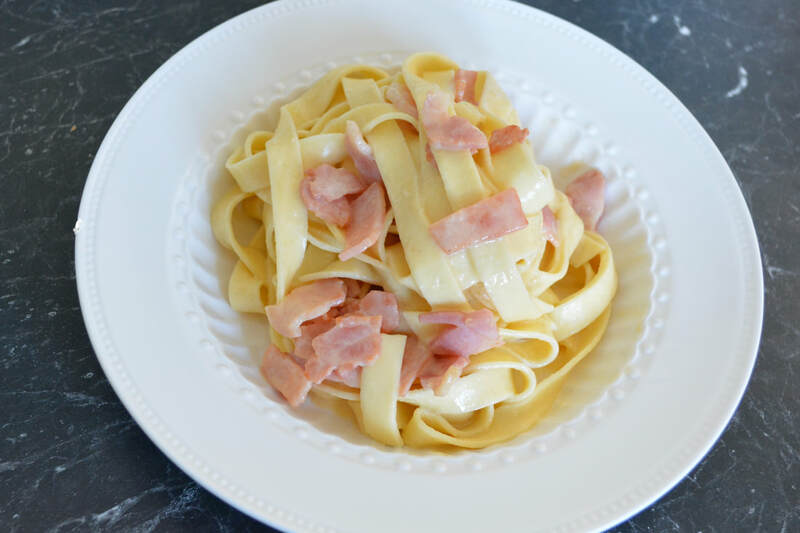 This recipe should be called "Carbonara, isn't that like bacon and eggs" for that is what my daughter said to me. It was obvious she didn't feel like bacon and eggs, and that she felt like pasta, and that she new bacon and eggs go into carbonara. So I caved and said yes to the Carbonana. Am I glad I did, it was fantastic, every mouthful was amazing, it turned out perfectly. My kids loved it, I loved it, my husband wouldn't try it-he does not appreciate creamy pastas. And it was easy to make, super easy in fact. It was my best Carbonara to date. This is a dish everyone should try, and it is especially great when you don't feel like cooking. The sauce is made in less than 10 minutes. Nigella uses pancetta in her recipe, I had bacon at home so I used bacon, and it was amazing. I used 300g bacon, as when I cut away large chunks of the fat I was left with approximately 275g to cook with. Now I am going to name the brand of pasta I love. It is Guzzi's an Australian owned and made company. 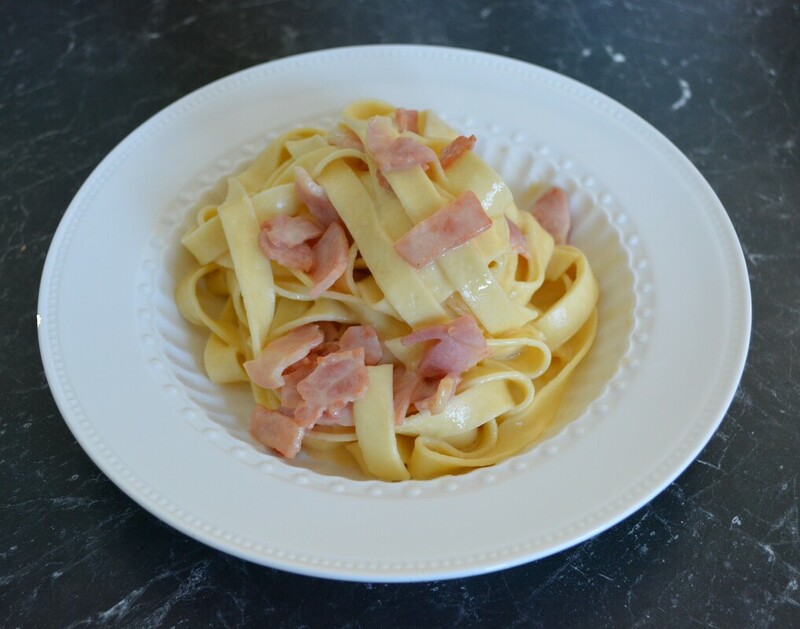 There fettuccine is my absolute favourite. It is a little more expensive than the normal pasta you can buy, but it is so good. Give it a try, you will love every messy mouthful. Add oil to a frying pan over medium heat. Add the bacon and cook until it has started to brown and is crispy but not crunchy. Pour in the wine, let it simmer away, until you have a small amount of the liquid left. Take the pan off the heat. In a bowl add the cream, eggs and parmesan. Season with pepper and a small amount of salt as the bacon can be salty. Beat the mixture together until combined. Cook the pasta as per packet directions, check it 2 minutes before it should be done, I like it just cooked, nothing worse than soggy pasta. Lower a cup into the pasta water and remove approximately 1/2 cup of the pasta water before draining, pour it over the bacon. When the pasta is cooked to your liking, drain the pasta. Return the pasta back into the pot, add the bacon and any liquid from the pan. Stir it through. Add the egg and cheese mixture to the pasta, quickly mix it through. The heat of the pasta will cook the eggs.